It stood for 62 years and helped earn New Hampshire’s 6,288-foot Mt. Washington the distinction of having the World’s Worst Weather. Yet, more than a decade ago, a little known tropical cyclone in the South Indian Ocean blew away Mt. Washington’s famous gust of 234 mph — the previous fastest wind ever measured on Earth outside of a tornado. 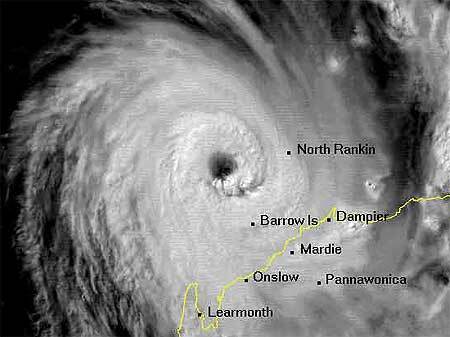 According to the World Meteorological Organization (WMO), the record now belongs to Barrow Island, Australia, a spot of land 31 miles off that continent’s northwest coast that was blasted by Tropical Cyclone Olivia on April 10, 1996. Olivia delivered a record gust of 253 mph (408 kph). A panel of scientists charged with determining global weather and climate extremes as part of the WMO’s Commission for Climatology (CCl) recently reviewed numerous exceptional wind gusts recorded on Barrow Island during Olivia. They concluded that five peak gusts, ranging from 186 mph to the peak of 253 mph were indeed accurate. The other gusts measured 229 mph, 233 mph, and 215 mph, lending credibility to the record wind. The scientists concluded that a mesovortex in Olivia’s well-defined eyewall was likely the cause of the extreme winds. But the record wind went unnoticed for a decade before the panel happened upon the observations from Barrow Island. Already stunned by losing the record wind gust distinction, Mt. Washington Observatory Executive Director Scot Henley told the Associated Press he was shocked the record remained hidden so long. Well, it might not have been quite as simple as that, as Jeff Masters of Weather Underground reports in his blog. He writes that Australia’s Bureau of Meteorology (BOM) was notified about the gusts, but considered them suspect since they were extraordinarily high for a 145 mph tropical cyclone, and because the accuracy of the equipment used to measure the gusts was unknown. Even after a paper on the extreme wind was written in 1999, the data remained in wait another 10 years until someone with the BOM resurrected it and brought it to the attention of the CCl. Read more about why it took 14 years for the record wind to be recognized. The CCl panel determined the instrument that measured the record wind was a “heavy duty three-cup Synchrotac anemometer,” its report states. It was located near the center of Barrow Island and positioned 33 feet (10 m) above ground level and 210 feet (64 m) above sea level in relatively open terrain. Guy wires stabilized the cyclone-rated Hills telescoping mounting tower, and the anemometer was found to be regularly inspected and calibrated. According to Wikipedia, Barrow Island, which is slightly larger than Brooklyn, New York, was uninhabited until the 20th century. Oil was discovered there in commercial quantities in 1964 and subsequent drilling resulted in Barrow Island becoming Australia’s leading producer of petroleum and natural gas. The anemometer that measured the world’s new fastest surface wind is owned and maintained by Chevron. A report of the record wind is posted on the Arizona State University Web site. It contains additional details of Olivia’s record event and names the report’s panel of experts within CCl. Symmetric astronomical patterns occur when tropical storms form. The symmetries set up a disturbed magnetic field pattern on the earth’s surface. Charged particles, such as water with its partial polar property, respond to the U-shaped magnetic field and spiral around the disturbance. Both wind speed records (tornado and non-tornado) were broken on the same day 10th April 1996, interesting I thought..